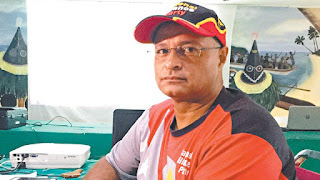 Namatanai MP Walter Schnaubelt has tasked the New Ireland Provincial Government to explain the whereabouts of his district's share of mine royalties, as per an Agreement with the Lihir Gold Mine. He says since the start of the mine's operations in 2007, his District has not received its 20 per cent share of the funds. "The concern now is the 50% portion blong New Ireland Provincial Government which is responsible to dispatch 20% to Namatanai district and 20% to Kavieng district na 10 percent is retained by the provincial government blo administration purposes. "Orait, the provincial government component paid to date is K264m and you know since 2007 i kam nao, Namatanai district and Kavieng district have missed out on their 20% share."